Six female officers of the Indian Navy today began a historic journey that will test their combined endurance and sailing skills. The six women left aboard the Indian Naval Sailing Vessel Tarini on a circumnavigation effort that will see the officers spend more than 200 days at sea. This is the first time in India’s history that an all-woman crew is attempting to circumnavigate the globe. Previous notable attempts to circle the world include Captain (retd.) Dilip Donde’s solo circumnavigation and Cdr Abhilash Tomy’s non-stop circumnavigation of the globe. 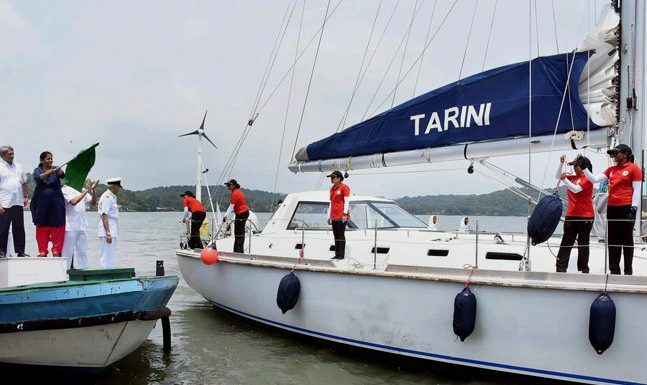 Defence Minister Nirmala Sitharaman today flagged off 55-foot INSV Tarini from the INS Mandovi naval training base in Goa, bidding adieu to Tarini’s skipper, Lt. Commander Vartika Joshi, and crew, Lt. Commanders Pratibha Jamwal, P Swathi, and Lieutenants S Vijaya Devi, B Aishwarya and Payal Gupta. “This is not an occasion which can happen once in five years, once in ten years. This is a historic day for India. A historic day, which will be marked in navigation history and globally,” Sitharaman said, after flagging off ‘Navika Sagar Parikrama’, the official name of the circumnavigation effort. “Our women are going to stand out for doing something which mostly wouldn’t even have been thought of,” Sitharaman, India’s first full-time female defence minister, said at the event, which was attended by former defence minister and current Goa Chief Minister Manohar Parrikar. Several sailing enthusiasts bid Tarini bon voyage as the naval ship headed out of the Goa harbour. Top Navy brass – including Chief of Naval Staff, Admiral Sunil Lanba, and Flag Officer Commanding-in-Chief, Southern Naval Command, Vice Admiral AR Karve, attended the flagging off ceremony. Prime Minister Narendra Modi, who met the six women last month, sent out his wishes to INSV Tarini’s crew earlier in the day. INSV Tarini and its six-member all-woman crew is expected to anchor back in Goa sometime in April, 2018. The 55-foot sailing vessel was indigenously built and was inducted into Navy earlier this year. During their circumnavigation journey the crew will make four stopover – Fremantle (Australia), Lyttleton (New Zealand), Port Stanley (Falklands), and Cape Town (South Africa). The first leg of the journey will see the women sail from Goa to Australia. The journey will see the officers sail through three oceans – Indian, Pacific and Atlantic. During the voyage, the crew will monitor and report marine pollution on the high seas, and collate and update meteorological, ocean and wave data in order to help the India Meteorological Department (IMD) better forecast the weather. The data will also be used to for research and development by various Indian organisations. The crew is also expected to meet with Persons of Indian Origin during their port-calls in Australia, New Zealand, Falklands and South Africa.